In June 2004, Apple Computer, Inc hosted the World Wide Developers Conference (WWDC) where Steve Jobs, the CEO of Apple Computer, gave the keynote presentation. During this presentation Jobs annouced new displays and previewed Mac OS X 10.4, which is also known as Tiger. 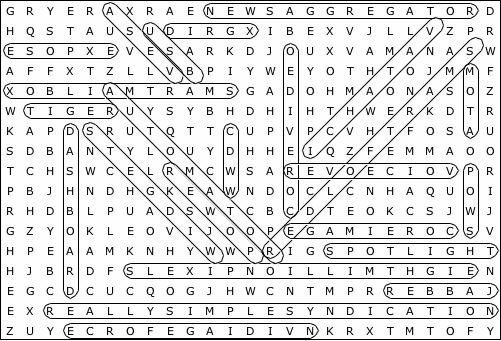 Here is a word search puzzle based on some of these announcements. Thanks to Sol Robots for providing a fully licensed version of the Mac OS X version of Crossword Forge to generate this puzzle. A copy of this puzzle, along with the solution, is also available from my website, www.nicholaspyers.com. Interested in reprinting this puzzle? Any non-profit Apple Macintosh User Group (MUG) may re-print, free of charge, any of the puzzles created by Nicholas Pyers found in the /puzzles directory of the nicholaspyers.com websites. There are just a couple of conditions, which basically boil down to letting us know – for the full details please visit https://www.nicholaspyers.com/reprints.